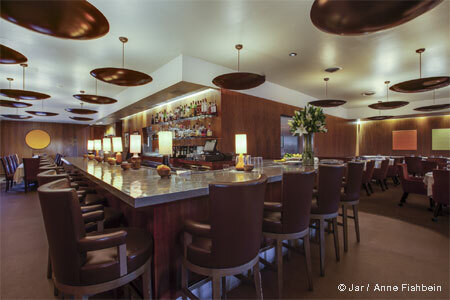 A cocktail lounge in Encino from mixologist Devon Espinosa and the Scratch Bar & Kitchen team. 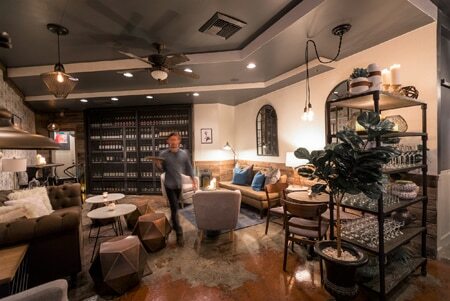 Open daily 12 p.m.-2 a.m.
About the chefs: Husband-and-wife team Phillip Frankland Lee and Margarita Kallas-Lee are turning a shopping center in Encino into an expected gourmet destination, first with the relocation of Scratch Bar & Kitchen and now with Woodley Proper. (The venues are on the second floor.) They partnered with mixologist Devon Espinosa on this bar with equally interesting food and libations. Décor: The space boasts a lounge-y atmosphere and good looks, courtesy of Jordan Olson. Likes: roasted marrow; the atmosphere. Drinks & Food: Espinosa's roster of cocktails includes classics (Sazerac, Aviation, Last Word, etc.) along with imaginative creations such as the Jordy, made with vodka, simple syrup, lemon, passion fruit purée, yellow chartreuse and raspberry foam. To keep you from going hungry, chef Lee has concocted a short, thoughtful menu that showcases his creativity. His version of chips and dip features pickled shrimp guacamole with prawn shell chips for scooping. Foie gras brings savory indulgence to churro bites, while roasted marrow is served on sourdough bread cleverly shaped like a bone. The “Snacks” section continues with raw bar offerings, house-cured charcuterie and artisanal cheeses (made exclusively for Scratch Bar & Kitchen) with accompaniments like jams and addictive candied pecans. There are also a few salads and main dishes, plus desserts from Kallas-Lee. Don't miss the brioche donuts with the wonderful bergamot whipped cream.